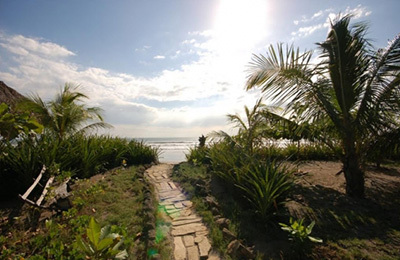 PLAYA SAN DIEGO ECO SURF LODGE & Surf Camp - Managua, Pacific Guests overall rating: ★★★★★ 5 based on 3 reviews. Known as “The land of lakes and volcanoes”, Nicaragua is also a fine but yet to be discovered surf destination, with world-class surfing conditions from September through to April. A ninety-minute drive south of Managua on the pristine Pacific Coast, the Surf & Ecolodge is a surfer hideaway right in front of a perfect beach break, with another four waves within walking distance of the lodge. The lodge comprises five beachside bungalows with private bathroom and a porch with hammocks. The typical palmed roofed rancho beach hut is where hungry surfers will enjoy hearty meals prepared with freshly caught fish while watching the action on the beach break opposite. Meals are prepared on order so that all tastes and diets are satisfied: vegan, vegetarian, no gluten, no lactose, paleo, Celiac, other allergies or restrictions can easily be accommodated. Perfect for couples and families, extra activities at the lodge include, horseback riding, therapeutic massage, sea turtle conservation, community service at a local school and nature hikes. – private toilet, shower and sink. – a bathroom with sink and shower. – toilets are a short walk away. 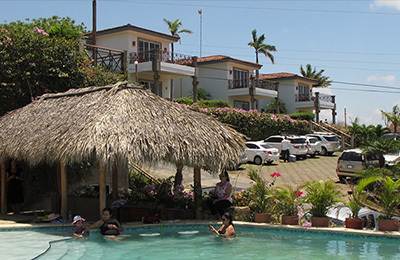 – Cabaña are located on the ocean-front or a few yards back. The spacious open-air ranchos are ideal for relaxing between surf sessions. Guests watch the surf from their hammocks and cool off with a cold drink. The restaurant serves gourmet cuisine made with the freshest local products. The house specialty is a fillet of snapper or snook, battered in a Mediterranean sauce and grilled on wood fire. Fine vegetarian plates are always available, as well as vegan, gluten-free and lactose-free options. Rancho’s: Gentle beach break right in front of the lodge. Ideal for beginners and long boarding. The yoga: Come and join us for some Yoga sessions, stretching, strengthening, breathing exercises and meditation are part of it. Lively and motivated we teach early Yoga sessions so you can start the day with positive and relaxed energy. Extending from the Caribbean to the Pacific coast, Nicaragua is the largest country in Central America, bordered by Honduras to the north and Costa Rica to the south. Known as “the land of lakes and volcanoes”, it contains Central America’s two largest lakes and numerous active volcanoes. A must is a visit to Lake Nicaragua, more than 160 km. (100 mi.) long and averaging 70 km (45 mi) wide. Once an arm of the Pacific, from which it is only 19 km (12 mi) distant, the lake still contains varieties of ocean creatures, including the only known freshwater sharks. The lakes showcases the scenic Ometepe island, topped by twin volcanoes and one of the most famous sights in the country. Tropical. Rainy season on the Pacific Coast from May through November. Managua Airport (MGA) 90 min. from the Surflodge (AA, Delta, Continental, Iberia, Taca) Warning: Continental Airlines do no accept surfboards! Perfect waves on your doorstep. No crowd, no planning, no transport to the spots or guiding is necessary. The gentle beach break right in front of the Surf Lodge offers clean medium size waves that are perfect for learning to surf and longboarding. We take pride in providing business opportunities to local men and women. We will gladly arrange these services for you. They can be paid cash to the providers. "I had a really cool experience with all of them. 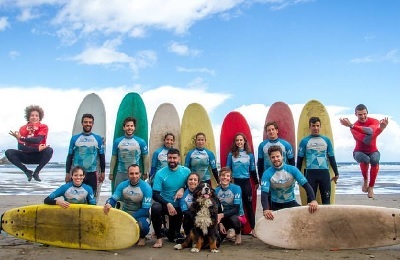 Cool people, good surf, delicious food and extraoridanry place. I will definitely come back again." 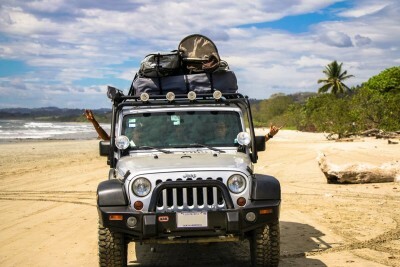 "My friend and I took a trip to Nica last summer and fell in love with this place! We planned to stay 3 days only, but ended up staying two extra days because none of us wanted to leave. Great food, nice people, very relaxing place ! Must visit if ever in Nicaragua! " "The Surf Lodge is simply a paradise. We stayed in the lodge 5 days in July. Empty waves were perfect when not too windy. There were only few people staying in the lodge, so most of time I had the beach all to myself. The lodge itself is beautiful, simple, perfectly clean and well maintained. The staff is wonderful and very friendly. Food is fresh and super delicious, despite lots of surfing, we never had time to get hungry before our next meal. There is no electricity or WIFI, which creates really relaxing atmosphere. All we did was surf, eat, did yoga, and get massages ($20 per hour!!! and very good). We stayed in bungalow # 7, overlooking the ocean with large balcony with patio furniture and hammocks. Nights were hot since the wind was always offshore. Bugs would eat you alive in the evening, bring lots of bug spray. Beds have mosquito nets, so nights are not a problem and during the day bugs are not too bad. I SUP, the board selection was not great, next time I will bring my board with me. There were more guards patrolling the property than guests and they were serious about their job so we felt very protected. Sunsets were gorgeous! We also were lucky to be there when the turtles were hitching, what a precious experience to release tiny turtle babies into the ocean! Overall, our stay was amazing and unforgettable. "